Lake front home in the heart of Lake Harmony, has a lot to offer. Within walking distance to 6 restaurants/bars, ice cream stand, and The Country Peddler General Store. Also minutes away are Jack Frost and Big Boulder ski resorts, Split Rock Resort, H20 Indoor Water Park, and Split Rock 27 hole Golf Course. Ample offstreet parking. The lakeside of the property features a 50'x75' grassy lawn, a large lakeside fire-pit, official length quoits and horseshoe pits. Great yard for wiffleball. The private dock offers two boat slips; jet ski slip ramp, wide steps for easy swimming access. There is a rowboat, kayak and canoe for your enjoyment. A wonderful 12'x20' covered outdoor lounge/dining area, complete with outdoor lights and electric. Enjoy this area no matter the weather. This family home features 3 levels. Main level (entry) has an open floor plan with a fully equipped sunny kitchen, dining area that has a picnic style table. Spacious living room, high ceiling and stone wood-burning fireplace. A 42' flat screen TV with DVD player. The adjacent room, hosts a desk, with WIFI and printer. Also, the powder room and laundry room are located on this level. Walk out onto the wonderful covered porch overlooking the lake, complete with rocking chairs, table and Weber gas grill. Uppe exr Level has three bedrooms. The master room has a queen bed and its own bathroom. A bedroom with a double bed, and a bedroom with two twin/singles, with a hall full bath. Lower (ground level) walks out to the yard and lake. This level has two connected, but separate rooms. A u-shaped bar looking out onto the lake, seating for 10, mini refrigerator, glassware, a 40' flat screen TV, dart board, queen futon, full bath, wood stove and Sirius XM Radio. The adjacent room has an 18' Official Shuffleboard table, queen sleeper/sofa, 50' TV with surround sound and DVD/CD player and propane fireplace. Feel free to bring your powerboat or jetski, local permit required. My husband grew up in Richboro, PA. He graduated from Council Rock and Bucknell University. I grew up in Fairless HIlls , graduated from Pennsbury and attended Rider University. Since my husband's family had a property in Lake Harmony, and he had fond family memories, we wanted to pass that along to our family. Our first house we built on Sky Drive, but wanted to be on the lake. So we bought the Lake House property, which was just an old fishing cabin. We eventually tore down the original house, and built the home that stands today. We are now retired and live here full time. There is nothing like being on the lake. Watching the sunset on the covered dock is truly relaxing. Just wonderful to sit on the covered porch in the morning while it is calm and watch the sun rise. Or to sit on the porch during a rain storm. We have a beautiful yard that leads to a covered dock. You will feel like you have come home the moment you walk in the front door. crock pot, fully stocked kitchen, dishes, glasware, pots and pans, etc. Best place for a fun getaway!! Thank you Denise and Jeff. 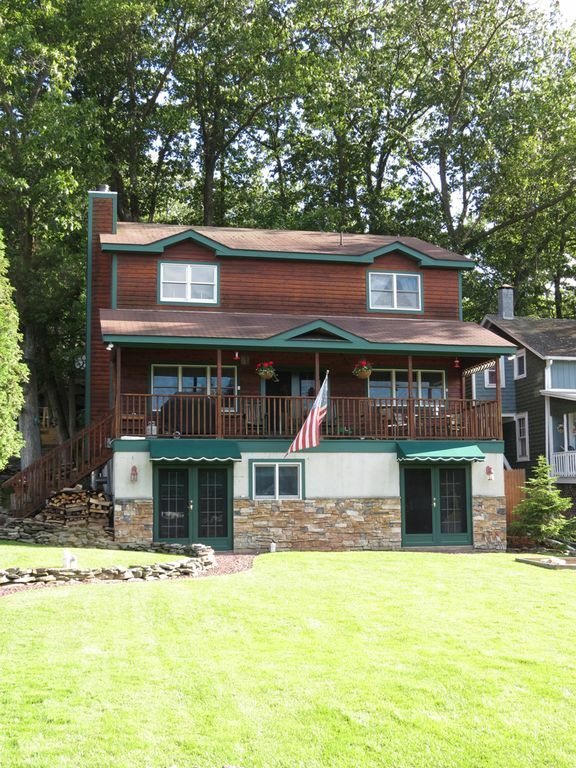 We loved staying at your home for our annual Poconos trip. Myself and my closest college friends get together each year. We needed to find a new place for this year and really lucked out. The place is beautiful, right on the lake, walking distance to food and bars, so clean and nice inside and the best basement I've ever seen. Pictures don't do it justice. To top it off the owners were great to work with. Easy in and out, lightning fast response to questions. Just perfect end to end. Before we checked out Sunday we all decided we need to reserve this place for the next 10 years of trips. It was so much fun to talk to you and hear about your college buddies. My husband also is very close to his college friends, so we know how much fun it is to get together. We are thrilled you were pleased with our home, and even happier that you will return. We also want to thank you for treating our home with such respect, that means so much. You were such a pleasure to work with, can't wait to catch up with you next year. Thank you again for choosing The Lake House. Comfortable. Great views on lake. Went to Lake Harmony to spend a weekend with family. This home was the most perfect place. Very comfortable . The open kitchen /living area was great to sit in. . We also enjoyed the game room-bar area. Would definitely stay here again. We are happy that you enjoyed your stay so much. We hope that you will be able to return sometime in the future . Thank you for choosing The Lake House. The house was clean and ready for people. The location was fantastic. My group will make this our annual winter get-away.. The next door neighbor was very nice and accommodating. Dealing with Denise so easy, can't wait till I can get back there again. We are so happy you were pleased. And we love it when our guests want to come back! Enjoy the rest of the winter and thank you very much for choosing our home for your weekend get away. Home was very clean and comfortable. The homeowners were accommodating and very responsive. Would love to spend time there again! We are so pleased you enjoyed your Thanksgiving. We enjoyed speaking with you and look forward to your return sometime. Beautiful- amazing location and peaceful retreat. The best way I could describe the house is that it feels like home the second you walk in. Denise and Jeff could not have done a better job creating a true lake getaway environment while also paying attention to the small details that you look for- the house is very clean, the bar downstairs is a fun social environment and the outdoor area is perfect for enjoying a BBQ, some backyard games, or just watching the boats pass by. The house is a short walk to Nick’s Lake House, Piggy’s, and Shenanigans. We will definitely be coming back very soon! Wow, you hit the nail on the head. Thank you, it's been fun to talk to you. This house is amazing. Absolutely the perfect mountain house!!! The house, the dock and the location are all excellent. My wife and I, along with two other couples spent the weekend and had a wonderful time. Relaxed on the dock equipped with a dining table, chairs, lights, and a bar. There were also 3 non motorized boats for our use. The lawn is perfect for lawn games and the stone fire pit was great for sitting around at night and roasting s'mores while looking out over the lake. The inside of the house was very clean and inviting. There was lots of interesting local sports nostalgia that was fun to look through and a wrap around bar plus a shuffle board table. This was really a great place to stay and we are already looking forward to going back next year. Also Denise was super friendly and accommodating. Hickory Run State Park, Boulder Field, Split Rock Resort, Split Rock Golf Course, Jack Frost National Golf Course, Mountain Laurel Golf Course, H2O Indoor Water Park, The Crossings Outlets, Mohegan Sun At Pocono Downs, Mt Airy Casino, White Water Rafting, Paintball, Kalahari Indoor Water Park.